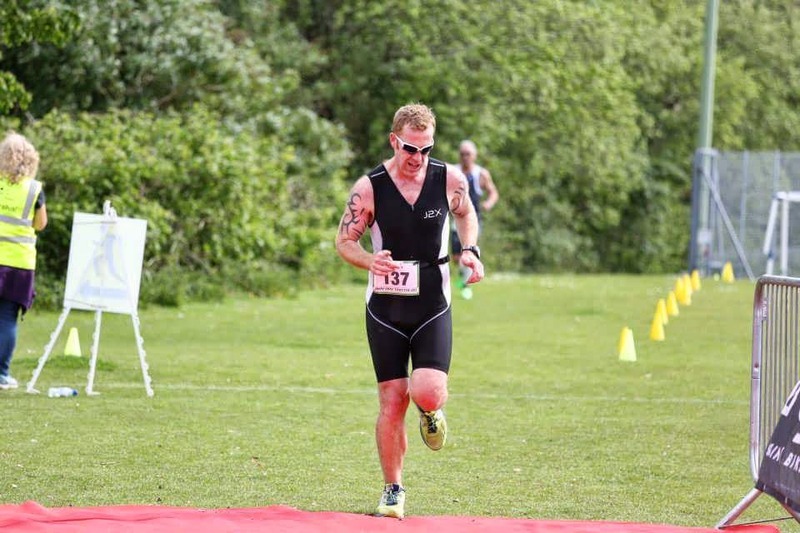 Only one week had passed since the Southampton Triathlon. Training had been slow! 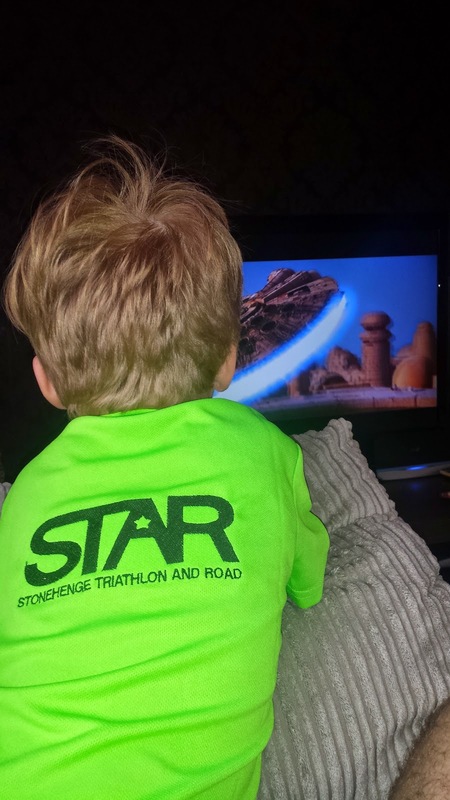 One ride had to be abandoned due to a broken wheel, which meant my bike had to go into the shop for repairs and I didn't get that back until Saturday and with only one 14km run done with the guys and girls from Stonehenge Triathlon and Road (STAR) if anything I was well rested! But I was ready for my second triathlon in a week! The day started at a more reasonable time, my start time was 0850 hrs but I had a race brief I had to attend at 0745 hrs. 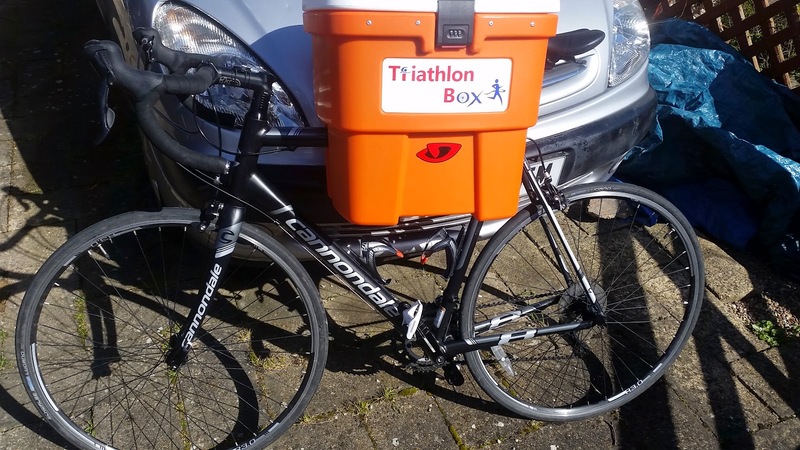 The ever trustee TriathlonBox was packed and along with the now fully repaired bike was loaded into the car for me to set off to Winchester. I had a feeling that the day would be a good one. My confidence in my own abilities was ever growing and I was feeling great. 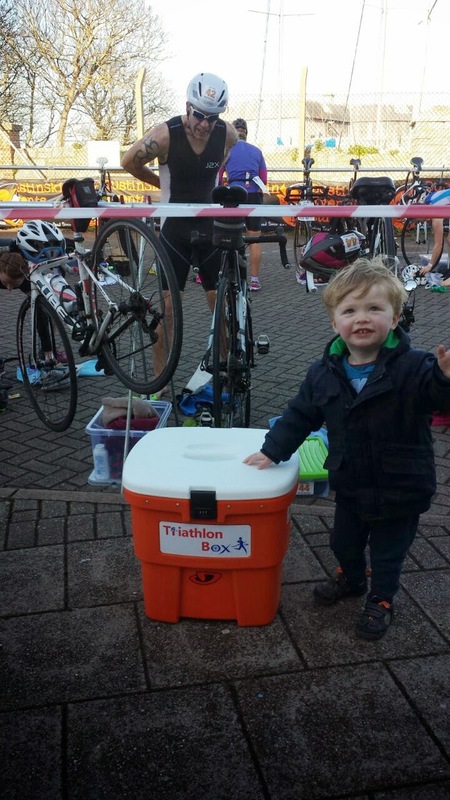 Also I knew that I would have lots of support as Georgie (my wife) and Freddie (my son) along with Lucy (my mother in law) and an old friend, Smithy, would there to see me race again. The weather was looking good for the race too and perhaps for the first time this year I'd be racing without any strong winds! many were taking part. I parked up and grabbed my kit from the car and made my way to registration. 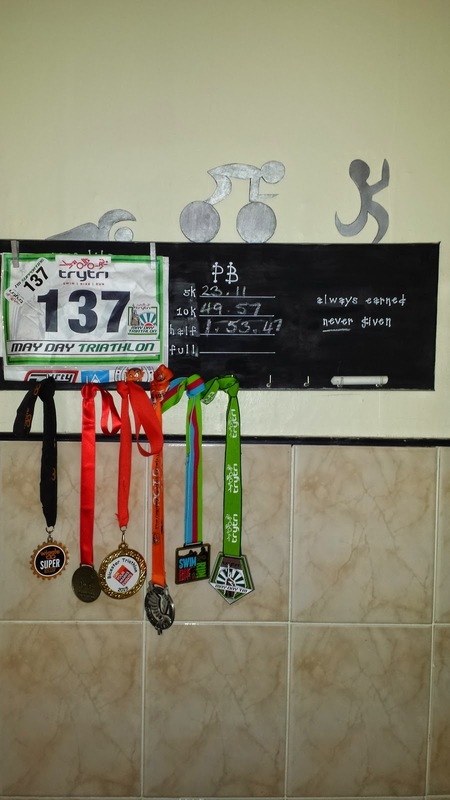 Once I'd registered and collected my numbers I took myself to one side and set about sticker the relevant race numbers in the right places. 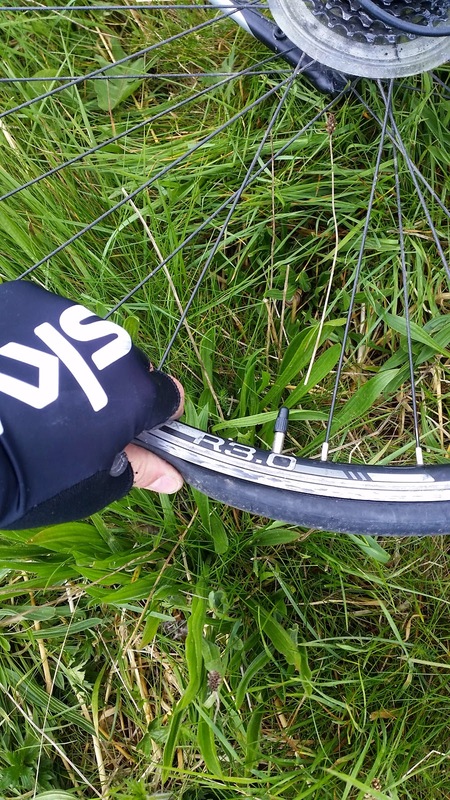 Having done this I made my way through to transition to rack my bike and sort my kit out. Already transition was heaving with people and it was becoming apparent that there wasn't going to be much room during the race. We were racked in Waves. I was in Wave 6 so about half way down on the left hand side. Once in the right area it was a free for all to find some space. I found a spot and sorted my kit allowing room for others but allowing enough room for myself. All racked and ready I went back into the hall and listened to the race brief before getting ready for my swim. The swim took place within the grounds of the school the event was being held at. It was a 6 lane pool and there was 4 people to a lane. Each of us had different coloured swim caps, Blue, White, Yellow and Orange. Blue would go first then the others would follow in order at 10 second intervals. We were briefed on the pool side that if we caught the swimmer in front to tap them on the foot and then that swimmer should get to the end of the length and allow the swimmer behind to pass. Everyone got that!!! Easy! Nothing hard nor difficult to remember, tap foot and wait! Simple. I was a blue hat so in my lane I was to set of on the first whistle. All four of us got in the pool and waited. He we go again - 3, 2, 1 GO! I was off - again! I got into a steady flow and kept the pace up. 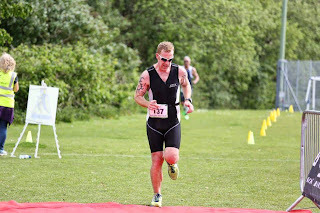 After 100m I was still in front and I was meeting the other 3 swimmers half down each length so I knew I was going well. I started to catch the others at around 300m in. I passed the first one with no problems as we met at the wall on the turn and they just let me past. Half way down the next length I caught the next swimmer and gave the obligatory tap on the foot. Now I'm no Olympic swimmer but at this point I was having to swim breaststroke but in the style of a elderly gentleman out for is afternoon swim. The wall was approaching and I got ready to get by and smash the last 75m. However, the chap in front had other ideas because at the wall he just turned and carried on. So I gave him another tap towards the end of the length again. But yet again he just ignored me and turned at the wall ignoring my request to let me past. I was losing time badly. With the wall approaching for my last turn he was still in front so I made the choice to just force my way past and try and get some time back down the last 25m. So at the wall I got along side him and turned before he did. But as I did the guy actually grabbed my foot in an attempt to pull me back. Naturally I was in the middle of a stroke so I 'strengthened' my kick and he soon let go. 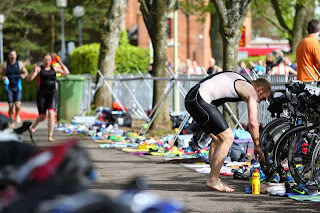 I powered down the last length and climbed out of the pool - a little annoyed but not much I could do now the swim was done and I was making my way out to T1. Official Swim Time - 00:09:00.
line. Official T1 Time - 00:01:39. At the end of transition a very helpful marshal pointed to the mount line and then the direction of which we had to travel. The route started down a little lane which then merged onto the main road and out on the course. It was a 2 lap dash over a 12km course. This would be the longest bike course on a triathlon I'd have done to date. The first part was reasonably flat and the pace was high with some slight downhills it got even higher. I was getting up to speeds of over 50kph and I was feeling good. That was all about to change very quickly. The lumps and bumps came thick and fast. Although only short they were steep and my speed was dropping fast. As fast as the hills approached the downhill the other side of the climb also arrived. They were a blessing as the speeds got back up to 40-45kph without having to pedal too. But the hills kept coming and they were leg sappingly steep. Some had nice downhills and some just levelled out. For 3-4km at a time the pace dropped to under 20kph and it was becoming a struggle and this was only LAP 1!!! At the end of the last hill there was a steep drop back down to the main road and over a roundabout. I could see the turning for the school ahead. I managed to negotiate the traffic lights without having to stop and blasted through to start the 2nd lap. I knew lap 2 would be hard but also knew that I would be able to use the first section of the ride to keep a high pace and keep the legs fresh for the hills that I knew were coming. The lumps and bumps were coming and I needed to get my legs ready for them again. During the pre-race brief the organisers had said that the run was 'cheeky'. During the 2nd lap of the bike I had seen some of the first starters on the run along the same road that we were riding on. The first section was along a bark type surface underneath some trees and then out onto the path. The route then turned left and the road started to rise slightly. My legs felt pretty heavy at this stage the ride had taken a lot out but I was starting to get a good rhythm going. At the top of the hill the route headed down a narrow track. Ahead I could see some of the other runners on the other side of the fence running down a field, I assumed to be the school. About half way down, the track became very steep. The run just got really difficult. People ahead of me were walking it was that steep. I just kept the legs going even though the pace dropped to just under 8min/km. Once the hill had peaked the route turned into the grounds of the school and the hill we just ran up was now going back down. To be honest it was difficult not to fall flat on my face it was pretty steep. The inevitable downhill became another uphill and the field turned to the right. Ahead I could see the finish line but I knew this wasnt the end as the run was also a 2 lap course. I ran past the finish line and made my way through the barriers which marked out the run through the school grounds. Once through that the run went past transition and back down to the start of the run for lap 2. The crowds were amazing and cheering anyone and everyone all around the course. It felt great. Lap 2 was very much the same as lap 1. I caught a few more on the hill into the school and knowing the route now I saved a bit for the sprint finish. The finish was approaching and just off to the left I could see Georgie and Freddie clapping and cheering me home. Couldn't miss Fred in his STAR T-Shirt. 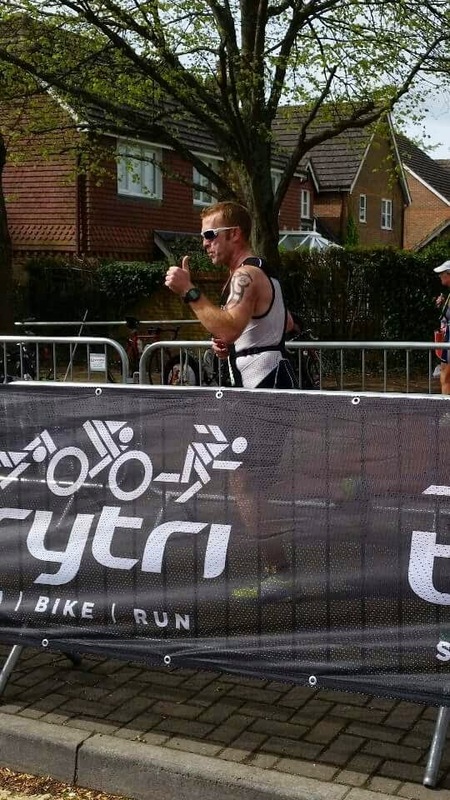 I gave everything I had left to the sprint finish and crossed the line! towards me and jumping into my arms. No matter how mu ch pain I was in he always makes me feel good! With all the photos taken it was time to get changed have coffee and get ready to go home were me and Fred had a day of Star Wars ahead of us! What a way to finish a great day. Once again I ask all of you that read this to remember why I'm doing it. To date with your help I have managed to raise £1025 which is past the halfway mark. So please keep giving where you can and share this with your family and friends for them to donate too. Visit my Just Giving to donate or alternatively text KOMS99 plus your donation to 70070. Next up is Cycle Wiltshire, 100 mile ride across the hills of the Wiltshire Downs on May 9th so look out for another blog soon. 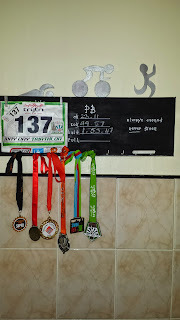 Two weeks had past since I lost my 'triathlon virginity' and now it was time to do it all over again. 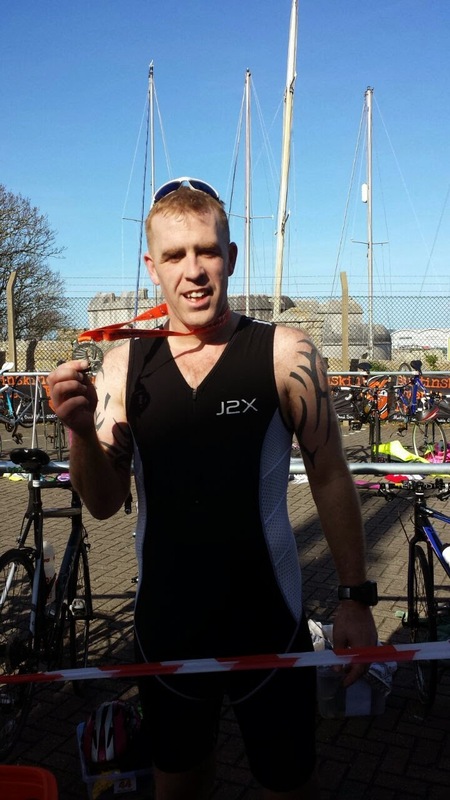 The Weymouth Triathlon, organised by the folks at Bustinskin, was upon me and with it Challenge 5 of my Charity Challenge Year. 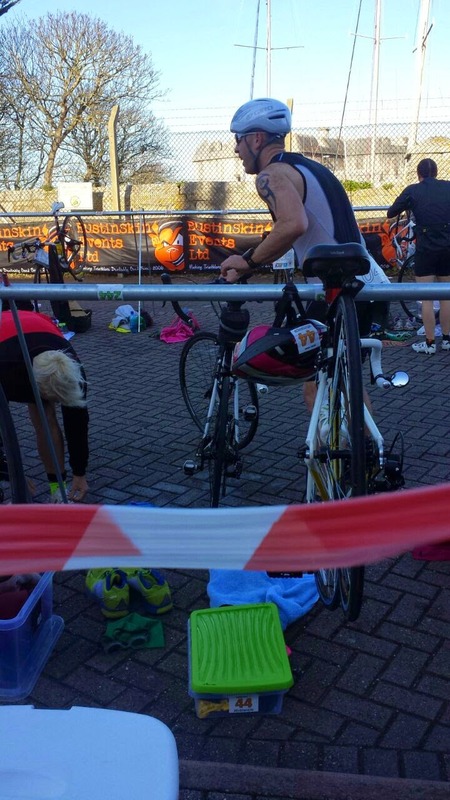 From never doing a triathlon in my life I was now about to do my second in two weeks and I was ready and feeling great. The whole Challenge started a day earlier this time. As the event registration was 0630hrs to 0730hrs on race day it would have meant leaving home about 0400hrs in the morning, which to be honest didn't fill me with joy! Therefore the command decision was made that we would make a family weekend of it. So Saturday morning me, Georgie (my wife), Freddie (my little boy) and Lucy (my mother in law) packed the car and set of for Weymouth. 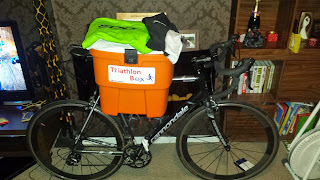 With everything I needed for the race packed away in my TriathlonBox and my bike on the rack there was plenty of room for the bags in the boot too. We trundled through the Dorset countryside and made our way to the hotel in Weymouth. The staff at the Crown Hotel where incredibly helpful. 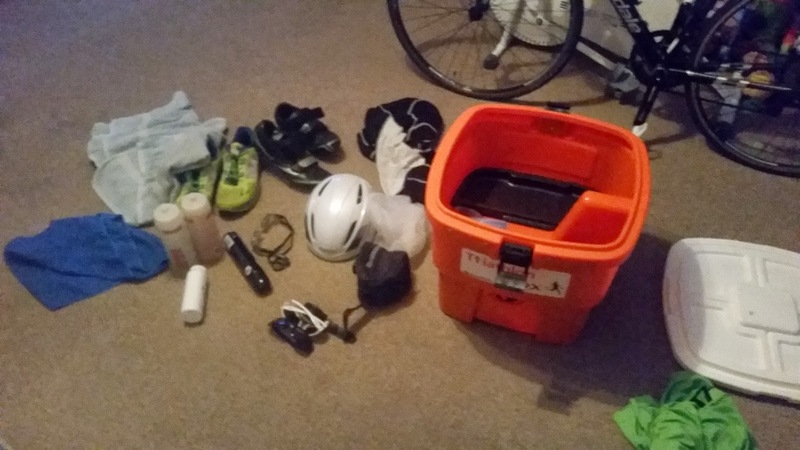 Letting me lock my bike and TriathlonBox in one of there store rooms and also organising an earlier than advertised breakfast for me and the family. 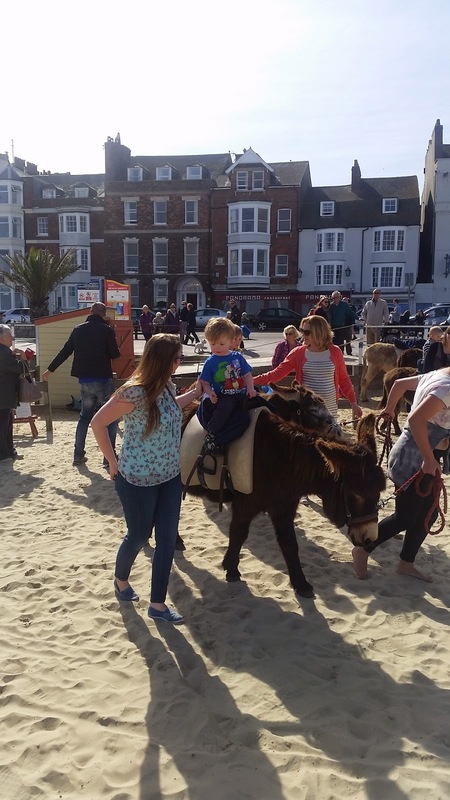 The rest of the day was spent watching Freddie running around on the beach, riding donkey's eating ice cream, building sandcastles and riding on as many fairground rides as possible. In my eyes it was the perfect way to relax before a race. We all headed back to the hotel after an amazing day at the beach had evening meal (a big fish pasta dish) and went to bed ready for an early start on race day. 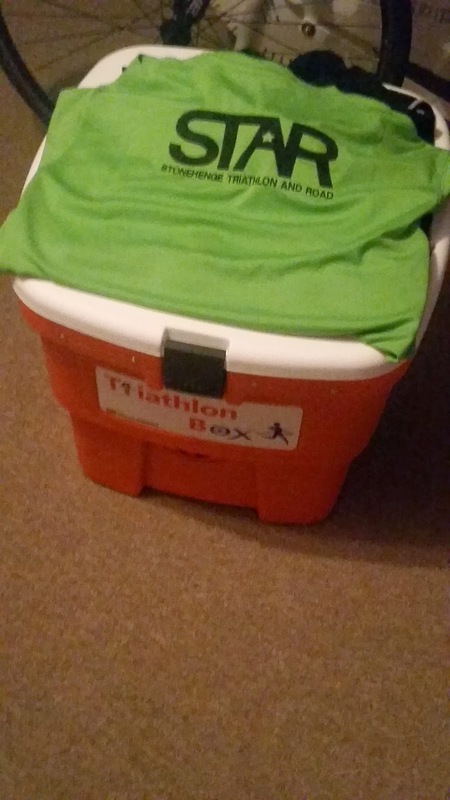 Although the venue was only 15 minutes drive from the hotel my alarm was set for 0500hrs which would give me time to get up, dressed and have breakfast ready to leave for the race at 0630hrs. The family were up and ready too and the day was looking beautiful. The weather report was dry and warm with a slight coastal breeze. I was excited for this one! 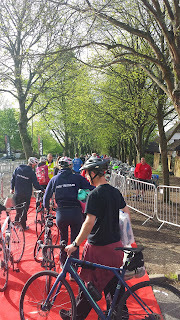 When we arrived at the race many people had already there sorting bikes and stuffing kit into plastic boxes struggling up the little hill up to the leisure centre. 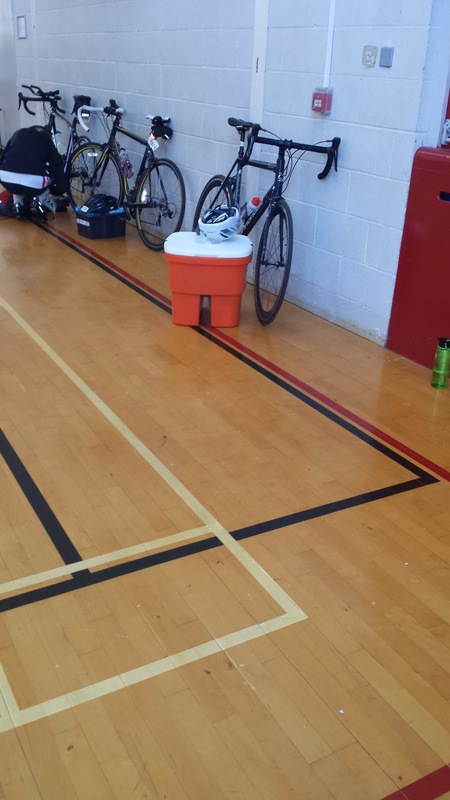 I grabbed my bike of the rack and fitted my TriathlonBox onto the top tube and strolled up to registration. Transition was already bustling with racers sorting their kit and placing helmets on bikes etc. I went down to registration and picked up my numbers and swim cap. I headed back out to the transition and found my place on the rack. On when the bike and out of my TriathlonBox came my helmet, shoes, trainers and towels. I placed them in order and checked and double checked. Now I was ready to race all that was left was a quick race brief and I'd be on pool side. The swim was a little different than at Bicester. Each wave waited on pool side in number order. 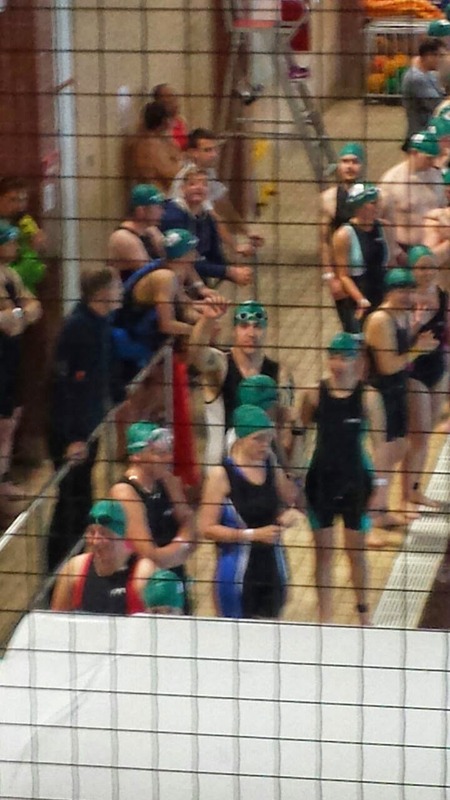 Each racer would get in the pool and start their swim then every 20 seconds the next person would start. After each 50m the swimmer would then enter the next lane and swim another 50m. So 6 lanes, 12 lengths would be 300m. As I was stood on pool side I was feeling good. I looked up to the viewing gallery above and could see my family waving to me with little Freddie waving his hands off. I was more than ready now and had real motivation to go! I was number 42 but after a few changes in the line up I probably wasn't 42nd in the pool. However my time had come. I got in the pool and waited for the count. The marshal counted me down from 5 and I was off! In what felt like the blink of an eye I was already entering lane 2 and starting my second 50. By the end of length 3 I had caught the swimmer in front and passed him at the turn. The first 100 was done and it had flown by. By the end of length 5 I had caught another 2 swimmers and passed them at the turn too. Half way down lane 6 and I got stuck behind another swimmer. This wasn't a bad thing it actually gave me a breather for a few seconds because at the turn I passed them and was away. Half way done and the lanes in front were now pretty clear all the way to the finish. I just kept my stroke steady and efficient and the ladders at the end of length 12 approached very quickly. The swim was done. I climbed out of the pool and ran out the back door as I hit the transition carpet I hit the lap button on my Garmin - 00:06:14. From the carpet out of the back of the pool to my bike was about 50/60m I was feeling strong and headed towards my bike. As I got there, Georgie was waiting right by my bike taking photos and cheering me on. I could here Freddie and Lucy cheering in the background too. On went the helmet and number belt followed quickly by my shoes. The bike came of the rack and I ran out to the mount line. I hit the line jumped on the bike and hit the lap button on the Garmin - 00:01:57. 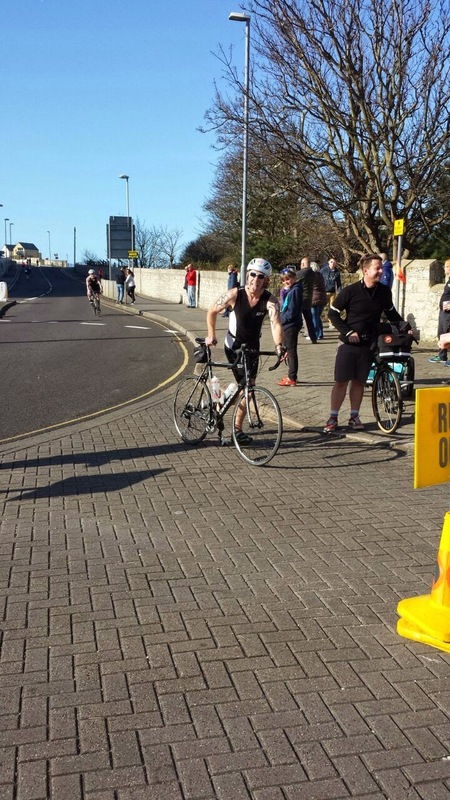 Now although the race was advertised as the Weymouth Triathlon it was actually on Portland. For those of you that don't know the island is essentially a hill and an extremely steep one too. 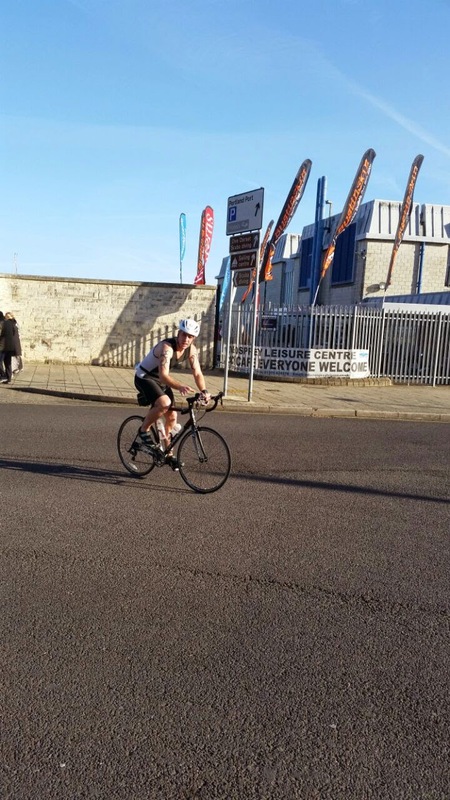 As I left transition there was a little roundabout to navigate on which one of the marshals shouted to me that I was to follow the road to the left and that there were two riders ahead of me. Round the roundabout I went and I followed the road to the left. Up ahead I could see the two riders as well as the aforementioned mega climb. Now like any cyclist I like a hill but this wasn't a Grand Tour, this was a triathlon and I was still recovering my legs from the swim. The hill was upon me and it lasted for about 3km from bottom to top. The road snaked up the hill too so it wasn't a straight road to the top. I'd caught the first of the two riders by the first hairpin about 1km in then the second very soon after. I was going alright. Although the hill was steep and long I was managing to keep my pace steady. I was out the saddle for a lot of it but my legs kept pumping and in the distance more riders were being reeled in. Thankfully at the top it leveled out nicely and I was able to really open up staying steady at around 35-40kph on the flats. There were still a few lumps to contend with which slowed me down a little but nothing to straining. I was passing people frequently and each time I did I set my sights on the next one ahead. The road was now flat and the sights were amazing. The sea to my left looked calm and steady with the sun bouncing off the water. I kept hammering on and in the distance I could see Portland Bill which I knew was the turning point. After the turn the route headed back towards the leisure centre on the same road back. About 13km in another little bump in the road reared its ugly head slowing me down to around 20kph. It didn't last very long however, about 1km, then the rapid decent started. The narrow winding roads of Portland were flying past me at nearly 60kph! It was quick which was good as it meant little peddling allowing me time to recover ready for the run! Around the last roundabout and up to transition I went and onto the dismount line. I clipped out of my peddles and ran down the side of transition and across the timing line where I hit the lap button on my Garmin again - 00:39:29. As I approached my racking area once again I was greeted by Georgie taking more photos and cheering me on. Off came the helmet and shoes. 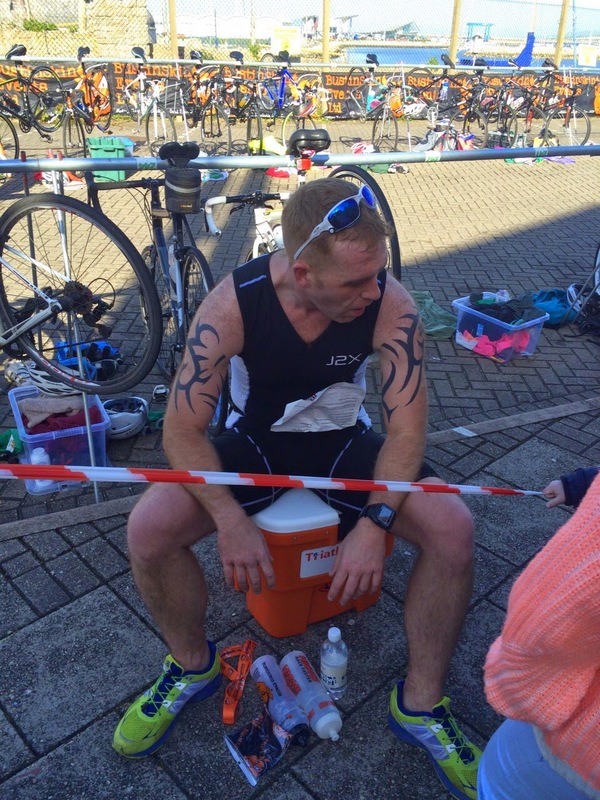 I spun my number round and slipped on my trainers and headed back out of transition. Across the mat I hit the button again - 00:01:43. As I headed out on the run my legs felt strong and I was feeling good. Ahead I could see two other runners up the road, about 800m ahead of me. I made the decision that I was going to catch them! I kept my stride long and pace steady at around 5min/km. There was a slight downhill out onto a flat section all the way out to the half way point. The run was totally flat and was an out and back route. The flag which indicated the half way point was along a coastal path right next to the harbour front. The flag was at 2.5km there was a drinks station about 600m from the flag. It was just before here that I caught the second of the two runners. I caught him and decided that I wasn't going past him and that I would run with him to the half way marker. We had a little chat and both decided to run together to the end! We kept each others pace high sticking around the 5min/km mark. The coastal path was almost like a trail route, jagged rocks and holes, ankle turners I call them, so the pace slowed slightly just to stay safe. The run was going extremely well so far. As we approached the end of the race it was decided between us that when we reached the top of the little hill just outside the leisure centre we would 'give it the beans' to the finish line. 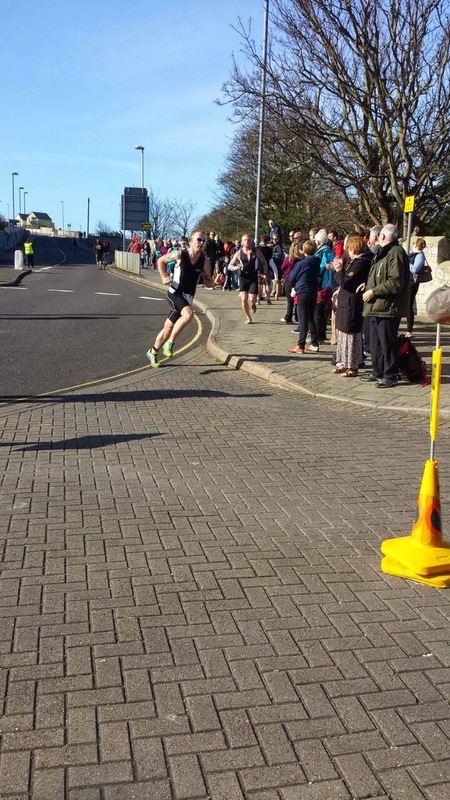 As we hit the top I opened up my stride and give it everything I had left into the finish. 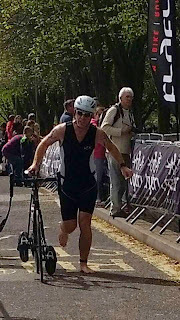 I was sprinting in, well as best I could at the end of a triathlon. In the background noise around me I could here more voices cheering me on. The voices I heard I recognised too! Georgie, Freddie and Lucy were there as well as Steph and Lee with their girls, friends of ours who had come up to Portland to cheer me on! I kept going hard to the finish and crossed the line - 00:24:02! At the finish line I was greeted with a medal and some freebies, to be honest right now I was to busy trying to get my breath back. I walked back to my racking point were I was met by my support. 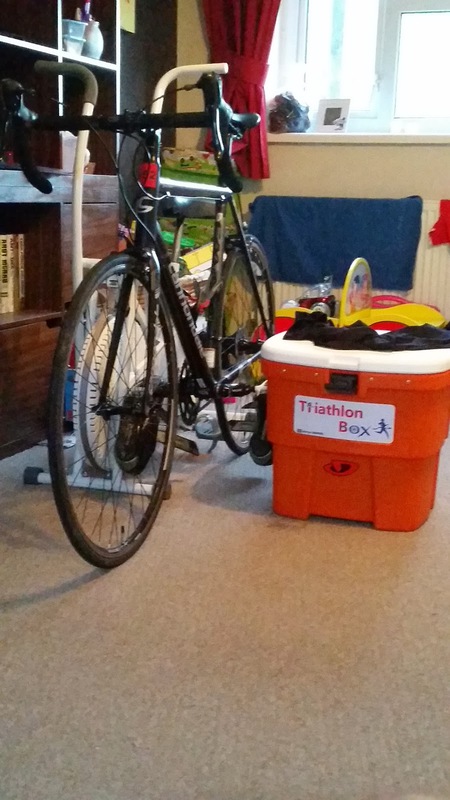 I took a seat on my TriathlonBox and knocked back a bottle of water. I'd done it my second ever triathlon complete! Challenge 5 complete. Now for the time. At Bicester I'd gone 01:23:47 had I gone better? Well in a word YES!! I'd smashed in fact 01:13:03 official!! I was delighted! I was 10 minutes quicker over a much tougher course. I couldn't have asked for more! Having my family and friends there to see me in was just the best feeling in the world and now I'd taken 10 minutes off my PB! To top it all off it was now only 1030hrs and we all had the rest of the day on the beach to recover. Nothing could be better! Challenge 5 done and who would have believed it! 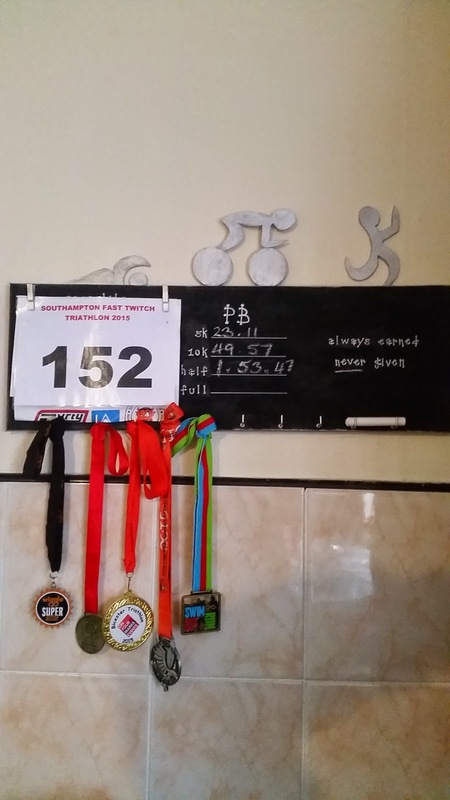 Please remember that all of this is for a charity close to my heart and because of the amazing generosity of many of the readers of this blog as well as family and friends I have so far managed to raise £925! Which is just incredible!! Its completely overwhelming that so many people care and have made the effort to text or visit the JustGiving page! But obviously as with all charity work I would love to make more so you can text the word KOMS99 followed by your donation to 70070 (i.e. 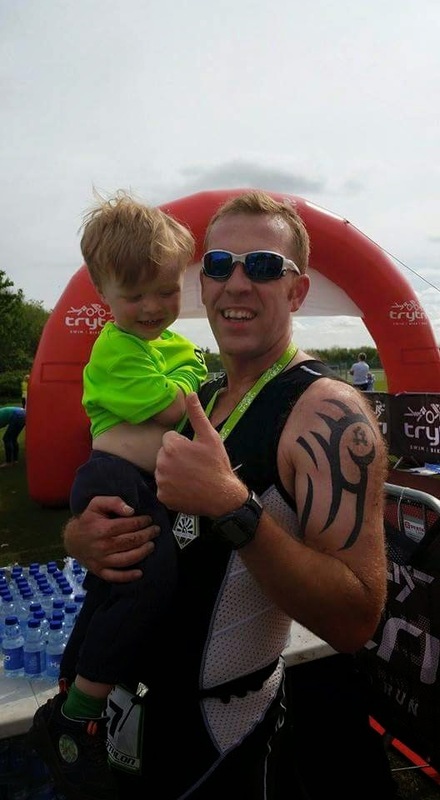 KOMS99 £5 to 70070) or visit my JustGiving page! I cant thank you all individually but want you all to know that I am eternally grateful for all your support and hope that you will all stick with me over the next 7 challenges to come! 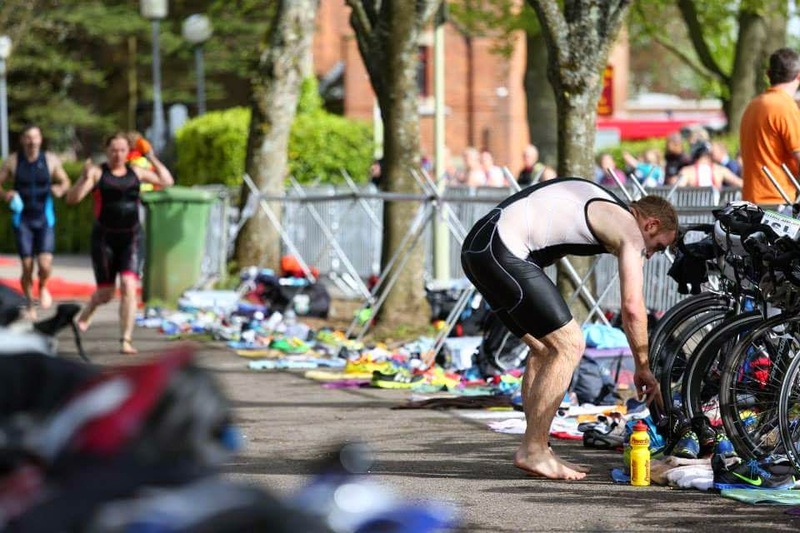 Next up is the Southampton Triathlon 26 April 2015!